The 24/7 Traffic Collection is a line of similar-styled satchels and pouches sold exclusively through Adorama Camera. The urban-designed collection includes several holster pouches as well as a few over-the-shoulder bags. 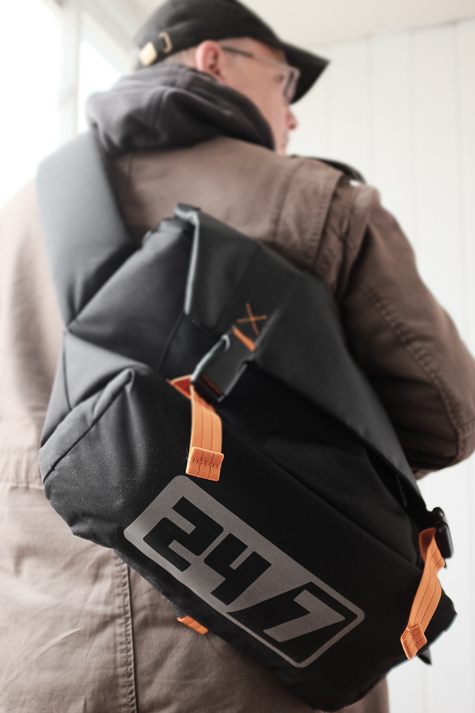 I got my hands on their larger 24/7 Messenger Bag, which is not a camera bag per se, but it can carry your camera, some ancillary gear, plus other stuff. 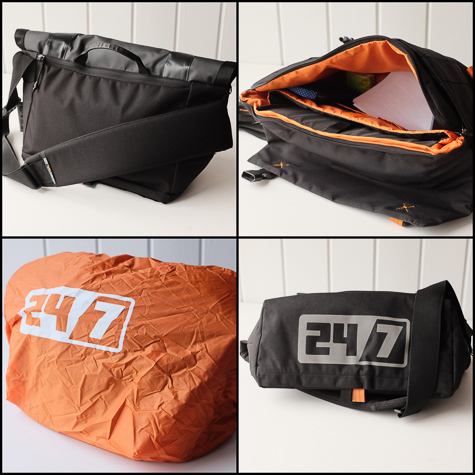 The 24/7 Messenger, as the name implies, is a medium large messenger bag, designed to be used as an everyday satchel as well as over-the-shoulder bag for when you ride your bike. It’s a classic messenger design that has a single thick shoulder strap with an oversized shoulder pad and a fairly large cover with big locking latches. 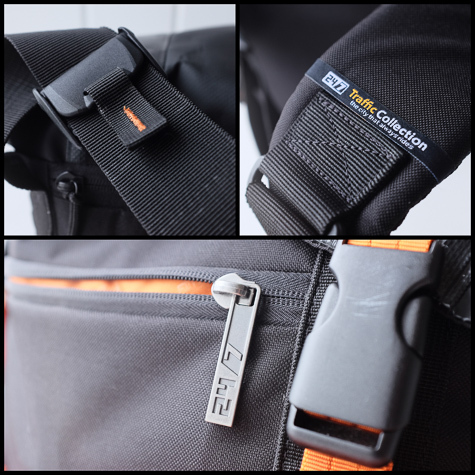 The shoulder strap is thickly padded in the correct spot where it would naturally rest on your shoulder. A quick adjustment latch that you can operate one handed will alter the strap’s length without having to remove the bag from your shoulder or, presumably, your other hand from the bicycle handlebars. The 24/7 is meant to sling across your left shoulder, but you can just carry it over your right shoulder if you’d like, but I wouldn’t do it for an extended period because that’s not how it’s designed to be carried. With the 24/7 slung across my back, It almost felt like it was giving me a hug; it never felt like it was going to slip or slide. The cover is a matte black synthetic material with a very soft feel to it, almost like old, worn leather. There are no animal products that I could see being used on the 24/7, in case that means anything to you. The cover is waterproof, or at least highly water resistant like the rest of the satchel. Large plastic latches keep the cover securely closed and they can be easily unlatched with one hand. The exterior material of the 24/7 feels very strong and resistant to tears and rips. The stitching on the outside is such that the seams are folded in on themselves so that they’re are not exposed to the elements. On the back of the 24/7 is a zippered pouch, which can fit large tablets and books and papers. There’s a small zippered pouch on the front as well. The bottom has a 24/7 logo screened onto it in a light reflective material so that when you’re riding at night, or even just walking, the bottom of the bag acts as a reflector. This is a really clever detail, though I wish the logo was bigger or there was more reflective material on the bottom. Hidden underneath is a really nice bright orange rain cover. This cover pulls over the entire front, sides, and bottom of the satchel, making those surfaces almost impervious to rain. The rain cover doesn’t go over the rear because that side is flush with your back and thus not exposed to the elements. I wish the rain cover would go over the back because the 24/7 is not always slung over my back and I’d like the full protection of the fully enclosing cover This is certainly not a deal breaker. The rain cover lives in the bottom of the bag, and when stowed, acts as extra padding. The rain cover is bright orange which also helps with visibility. I wish the logo printed on the cover was made of the same reflective material as the logo on the bottom. The interior is a nice bright orange, allowing you to better see the dark gear you stow inside the bag. There are the usual pouches for a 13” laptop computer and other numerous small slots for pens and business cards. One slot is reserved for a little SD card holder that comes with the 24/7. This SD holder is a padded, felt holder fitted into a plastic frame. 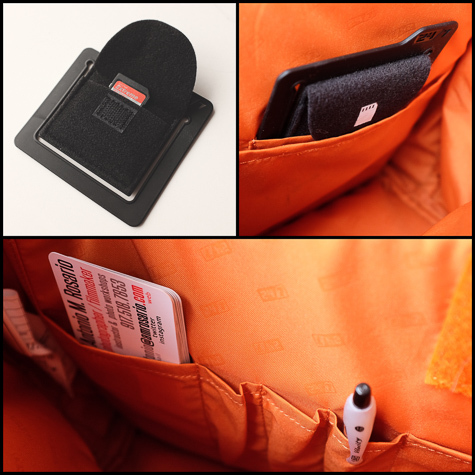 You can slip only one SD card in this holder and then place it in its special slot inside the bag. While this seemed useful, I actually found it to be an annoying gimmick. First, I never carry just one extra SD card with me, and when I do, I carry them in a special case. Also, I found it very difficult to pull the card out of this holder when I needed it. I just ended up just throwing this SD card holder away. 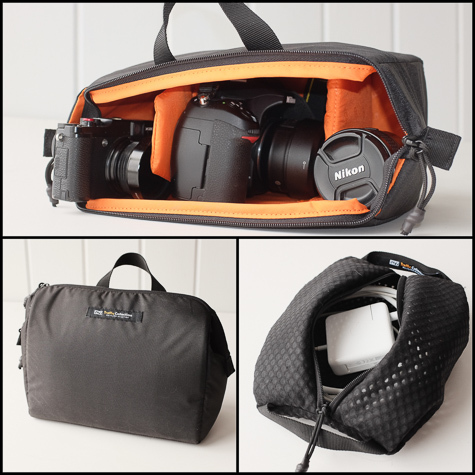 Included with the 24/7 are two removable pouches: one soft pouch for carrying loose items like chargers and power cables, and a second, more rigid one for camera gear. The latter is more like a small padded camera bag that you place your DSLR or mirrorless camera and a few accessories into. This camera pouch can zipper shut and has a small handle for grabbing. It is not meant to be a stand-alone camera bag since it doesn’t have its own strap. It’s slightly padded to protect your gear, but it cannot hold more than a modest sized DSLR and maybe one medium sized lens and maybe a flash or another small camera. I was able to fit my Nikon D300, two small lenses and my Fujifilm X20 mirrorless camera but that was it. I wish there were some expansion zippers on the sides to open in order to increase the internal volume. Once I put the cable pouch, small camera bag and my 13” MacBook Pro into the 24/7, there was very little room for anything else. I also wish there were some external pockets for water bottles and such. In all, I wish the 24/7 Messenger was just a little bit bigger. 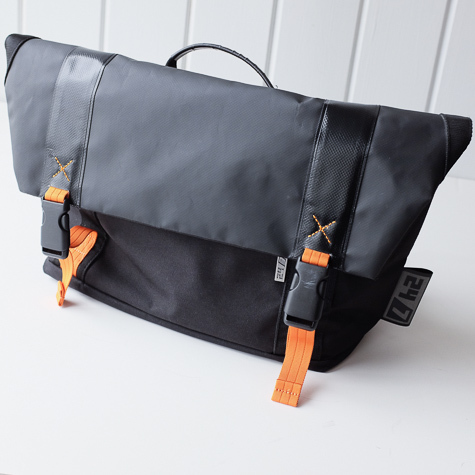 The 24/7 Messenger Bag is not designed for a photographer going on a big assignment or a location shoot. You can’t carry enough gear in it to cover a professional photo job. It’s also not a quick access bag, so forget run-and-gun shoots. But it’s not pretending to be only a camera bag even though it is being sold exclusively at Adorama Camera. 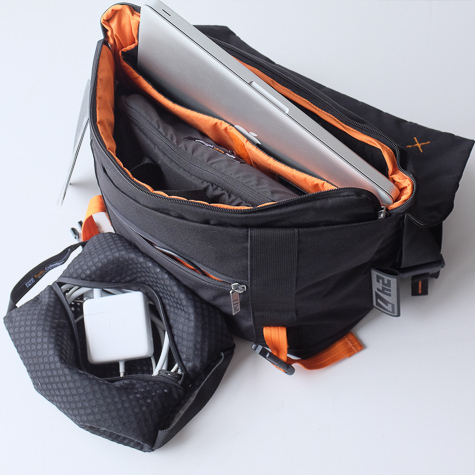 This satchel is really meant to get your stuff from point A to point B safely and securely, and it is certainly one of the most rugged bags I’ve reviewed for MyMac.com. The build quality is great and it will certainly last a long time. At the price it’s being offered at ($80 US), it’s a bargain. I recommend looking at the entire 24/7 Traffic Collection line at Adorama Camera. I’ll end this by saying this: I’m not a biker. While I do own a bike, it sits in storage for most of the winter and comes out when the weather starts improving. When it gets cold again, back it goes into storage until the next thaw. I live in New York City and as I’ve gotten older I’ve become more cautious about riding in the streets. But if I did ride my bike more often and needed to transport my gear to and fro, the 24/7 Messenger Bag would definitely be the one for me. I’d give it a solid 7 of 10 MyMac review rating.